With the lingering need to get away from it all, there is a place in the province of Leyte Philippines where you and your family can commune with nature. 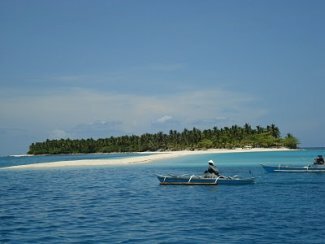 Kalanggaman is an island jeweled with ivory white sand, crystal clear waters with mixed aqua marine and blue colors as well as palm trees. It is approximately 12 kilometers from the town of Palompon, Leyte and located close to the province of Cebu. With an estimated size of less than 10 hectares, this strip of land was traditionally a fishing ground and a favorite site for recreation and social gatherings of the residents of Palompon. Kalanggaman’s root word, “langgam” is a Tagalog word for ant. It means bird in the Visayas dialect, thus it is oftentimes called Birds Island. Whatever it is, Kalanggaman Island is emerging as a beach holiday getaway in Leyte Philippines. Foreign tourists hop to the island from nearby Malapascua Island of Cebu. On weekends, it is full of local tourists - families, employees, yuppies, marine sports buffs and nature lovers. Always, on various occasions, Kalanggaman offers varied experiences and impressions. Kalanggaman strikes a sensitive balance between tourism and preservation of its natural charm. As one enjoys swimming in its clear aqua marine waters and frolicking in its white sandy beach, one would always hope that its picturesque shorelines, mangrove and marine life would remain intact for succeeding generations. The idealism of pristine nature would seem to be the trade-offs for the little physical discomfort of guests. For Kalanggaman is equipped only with the basic tourist facilities like restrooms, kiosks, canteen and battery - powered electricity. Appropriate and minimal development interventions that is. Kalanggaman is friendly to children and non-swimmers. The waves are not intimidating. Its special attraction is a white sand bar that appears and disappears along the western part of the islet depending on the direction of the waves. A briefing is given on activities and areas suited to scuba diving, swimming, bird watching, snorkeling, boating, etc. What is a day and night like in Kalanggaman? Camping is fun. You are safe and you can get a sound sleep on the beach. Have some mosquito repellant, just in case. More travel tips: sun block to protect your skin, sunglass, hat, flashlight, sleeping gear, mineral water, ice cubes and foodstuffs. Different strokes for different folks, however. Local picnic treats are typically Filipino - food galore from crispy lechon, adobo to root crops.